...but they like to use white because the boxes are open and the light escapes. Just did a harvest after 7 days. 390 grams from my 90 sq in screen. My Upflow Scrubber is producing what appears to be 2-3 types of Algae. All Macro-Growth is contained in the Scrubber since there is a Mesh/Screen Gate on outflow of ATS. Does it make sense that the Attached Stringy is it's stretch out, and the free floater are not stretched. This is an example of a free Floating Ball of Macro. I assume any growing algae is good. So long as it not intrusive to DT. Easy to harvest since these balls simply float to the top, and I scoop them out. So I'm a week into my scrubber and my display tank is still outgrowing at a furious pace. When can I possibly expect it to be beat by the scrubber? Here is what it looks like currently. I have one side of lights on just for the photo. Last edited by z3speed4me; 10/15/2017 at 07:24 AM. patience, nothing good is going to happen quickly. What are the nutrient levels? PO4 and NO3. If there are nutrients algae will grow and it really doesn't care where it grow as long as the environment is favorable. i.e. light and flow and PO4 and NO3. 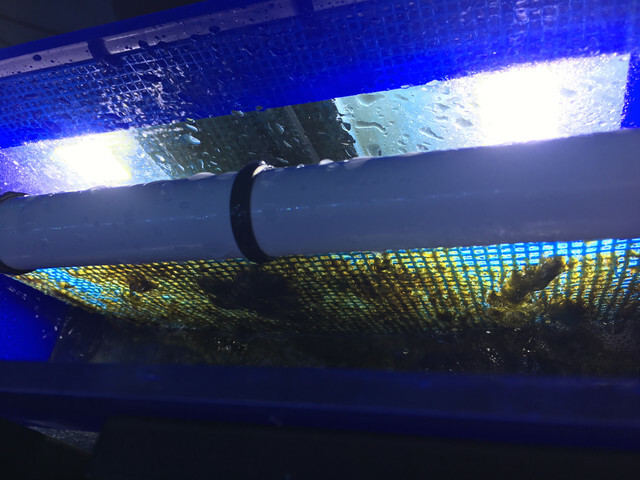 With an algae scrubber we are just trying to give the algae a more favorable place to grow. I don't know how big your tank is or how much you feed. I feed heavy and get great growth from my ATS but also dose carbon to keep nutrients under control. Levels are practically zero because algae is consuming it all. Tank is a 75 with 20 sump. I know patience is a virtue in this hobby, I had no algae for 18 months then boom out of nowhere a big bloom. I feed about two cubes a day and always have. Just wondering off everyone's experience how long until the scrubber starts to overpower the tank. Thx!! Rocks must have taken on enough phosphate to fuel algae. My guess is it'll take at least a couple months to start beating it back with ATS. Time to roll the dice. About 10 days....on new screen. Clean? Yea that's the part that confused me most Bc I blow them with a turkey baster like every few days. I put your Rev 3 L2 on my aquarium 6 months ago and connot get it to take off. Having trouble loading files right now. I'll try again shortly. The spray bar is different, & looks cool, but, look out for the holes getting clogged with detritus, and / or, algae growth clogging them up. 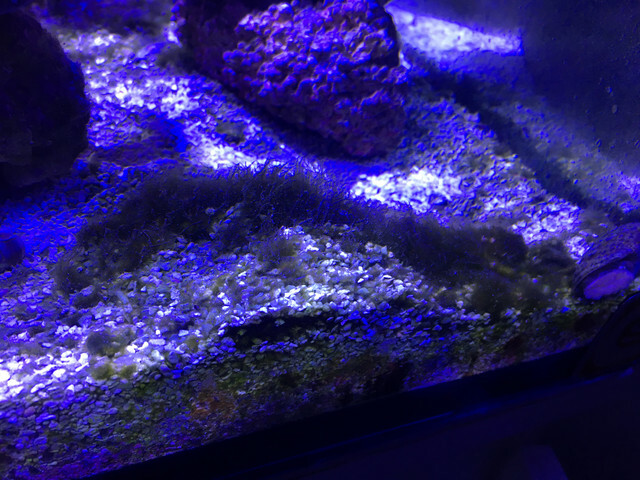 I'm back again, but for another ID question TO THE ALGAE EXPERTS. I started a FRAG TANK. It's couple of month old. Not much in there yet. 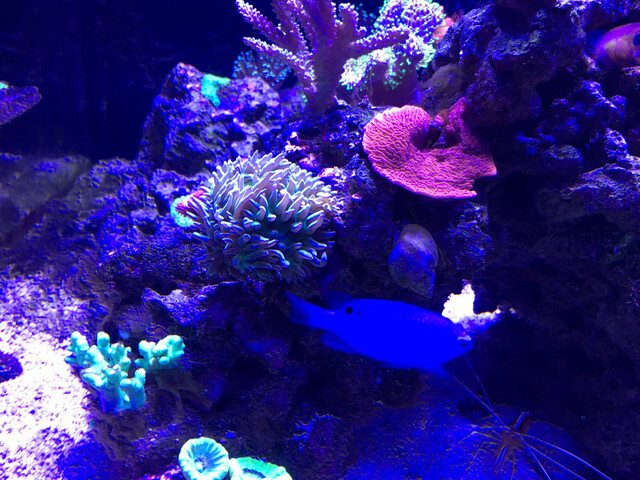 4 Frags, and I had a Cowrie in there cleaning green Algae out. Cowrie was move into separate section since he eats corals. So I started feeding PURPLE Seaweed (NORI) to COWRIE to keep him alive, and I heard NORI poo is great for SPS Corals. 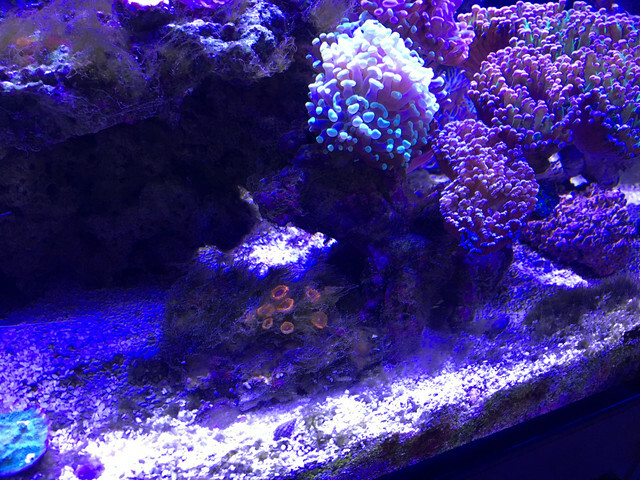 Then my FRAG TANK started getting this RED FILM. First I thought it might be Cyano. But no bubbles, not stringy. Really different. I thought it might be a Red Coraline. But it's soft and scrapes off with a razor blade kind of like GREEN FILM Algae on Display Tank. Not Hard or crystalline. I pulled out the USB SCOPE to check. Scaped off some with RAZOR Blade. When it really dried, it just become crumbly, like powder. Maybe Cowrie will eat it too? How many hours/day are you LEDs on? What is your flow rate? OK, I proved my THEORY. 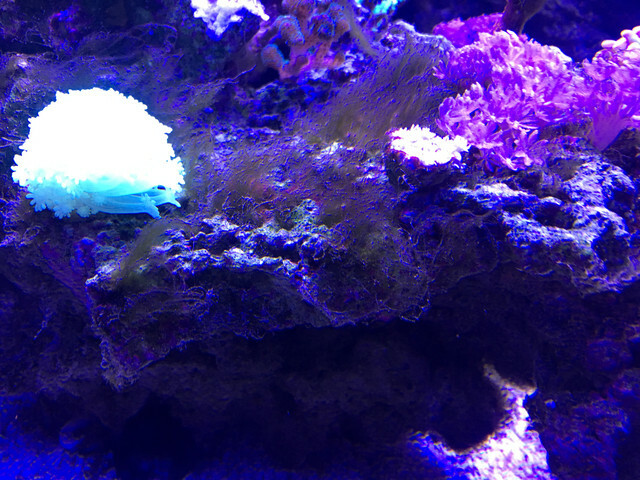 It is NORI that I've been feeding the Cowrie and it seeded my FRAG TANK with Purple Algae. Let the Cowrie loose on Left side. And to prove he ate it, I put Timelapse Web Cam on Area. This is good news since NO Cyano, and NORI poo is good for Corals. Is there a preferred method to preparing and feeding prime algae back to display for my tangs. What do you mean by prime algae? I feed my Tangs a leaf of Romaine lettuce each day plus 1/2 sheet of Nori. I use an magnetic algae clip for the lettuce and this for the Nori. Probably just means the best growth from a scrubber. Location: My tank is in Orange, California, USA. ... I live in Oceanside, California, USA. For Feeding Nori Sheets, I discovered this (MAGENTIC FEEDER/GRAZER) a while ago, and will never go back to Elastic Bands, Clips ,etc. The fish, snails, crabs have to peck at it to get their meal, but little/none gets out. You can place it low to allow your crabs to get to it, or high for Fish/SNails only. 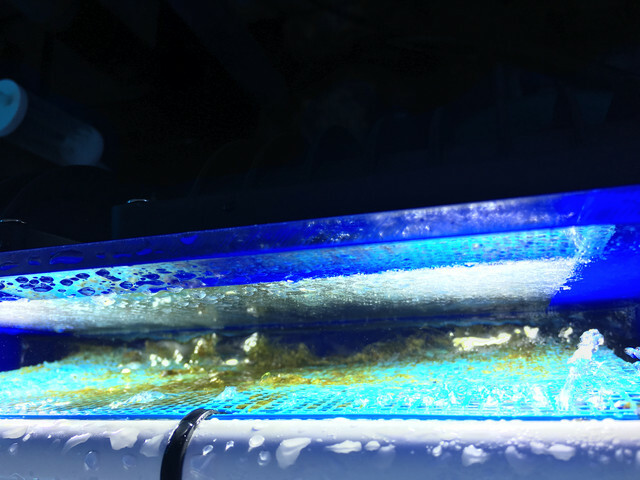 I have 2, and to me worth every penny since it contains the NORI well, so no loose stuff floats around your tank POLUTING IT, or unsightly stuff swirling in current.. It wastes a tiny bit at the Pinch points, but I just rinse it off and refill. Never tried it with Macro Algae but I figure it will work if you squish some in, and then wrap a elastic around the Flap. But don't expect to fit much since its a flap designed for thin Nori sheets.